In 1163, Bishop Absalon donated Asserbo to an abbey for monks of the Carthusian order. Later, it passed to the Cistercian order and various noble families until it wound up in the hands of the Crown in 1560. In the beginning of the 18th century, Asserbo was deserted when drifting sand covered the surrounding fields and villages. 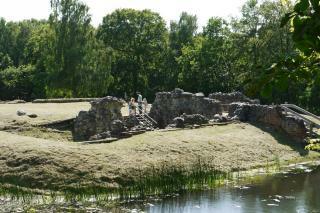 In 1849, King Frederik VII excavated Asserbo, helped by 12 soldiers. Today, the ruins nestle romantically in the forests of Tisvilde Hegn. The site of a nearby farm from Torup village has also been uncovered. The ruins are at the end of Bisp Absalons vej, a side road off highway 205 between Helsinge and Frederiksværk. As the sand continued to blow in from the sea, it became increasingly difficult to farm the land, until finally it was a lost cause. No crops would grow. The farmers of Torup village were forced to leave their homes. By 1595, only six farms remained and then even these were swallowed up by the sand, which also covered Asserbo Castle's courtyard and filled the moat. Tibirke Church almost sanded up, too. Wattle fencing was erected in the early 18th century to try to stop the sand, and then forests were planted in around 1800. The crippled pine trees in the 'enchanted forest' show just how hard it was for the trees to take root.